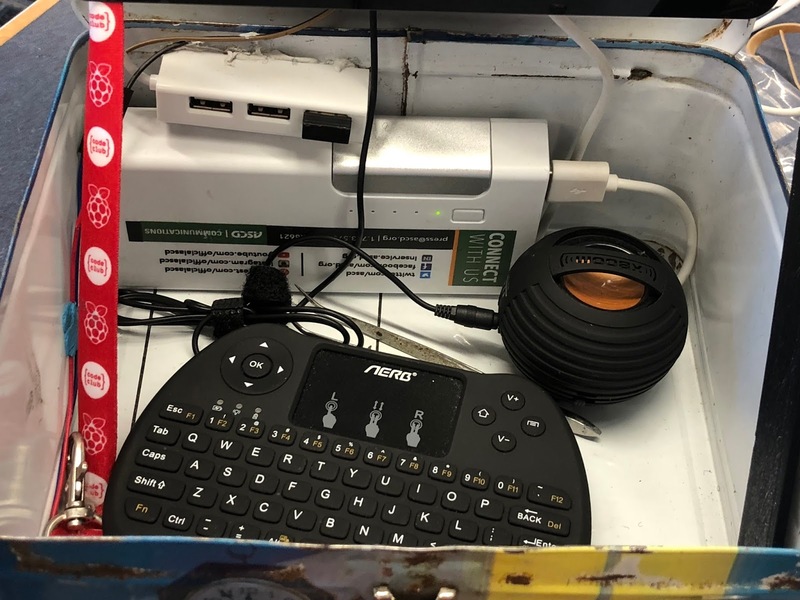 I woke up Sunday and thought it would be cool to put a computer inside my lunchbox. I'm not sure the exact reason why I wanted to, but I wanted to. I'm sure I saw something on the Internet about doing this months ago and it worked its way through my subconscious and out of my brain on Sunday morning. So, I went downstairs to my basement and my Makerspace and got to work. I grabbed pieces from around my workshop area and realized I had everything I needed. 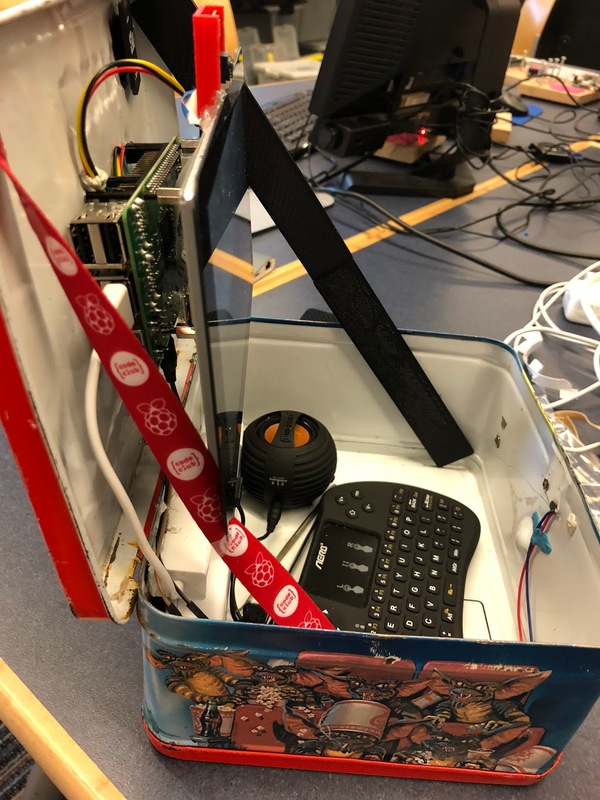 Within a 90 minutes, I had a working Pi powered Lunchbox Computer. It is perfect for my #Make52 Challenge this year. Check out other posts I've made on Instagram for each week of #Make52. 1.You need to find the right size lunchbox that can hold the screen you are going to use. The official Raspberry Pi touch screen is 7 inches. Your lunch box needs to be able to hold a screen that size. 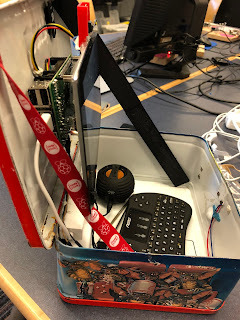 The Raspberry Pi is mounted to the back of the monitor and the Pi will be mounted to the inside of the lunchbox door. 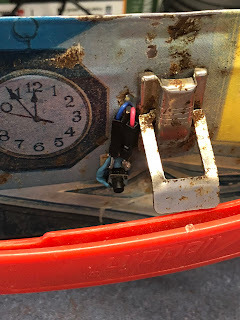 You need to make sure your screen and Pi connection are not too thick or you will not be able to close the lunchbox. 2. Plug in the USB extender and mount on the back wall of the lunchbox. This gives you access to USB ports without having to reach into the back of the screen. You can use glue or double sided tape to mount the USB block. 3. Depending on the size of your portable battery, you can mount it just below the USB extender. Mine is long and then and was given to me at a conference. I mounted this with velcro so I can take it out for recharging as needed. Plug the Raspberry Pi directly into the battery and make sure your on button is accessible so you can turn on the Pi. 4. The speaker is a small portable one I had around the house. It is short enough to give the screen the room it needs and it is charged using the battery. Plug it in to the Pi. I use velcro to keep it in place in the lunchbox. The velcro also allows me to take it out for charging as needed. 5. The wireless keyboard using a small USB dongle that I plug into the USB extender. I use velcro on the keyboard. 6. 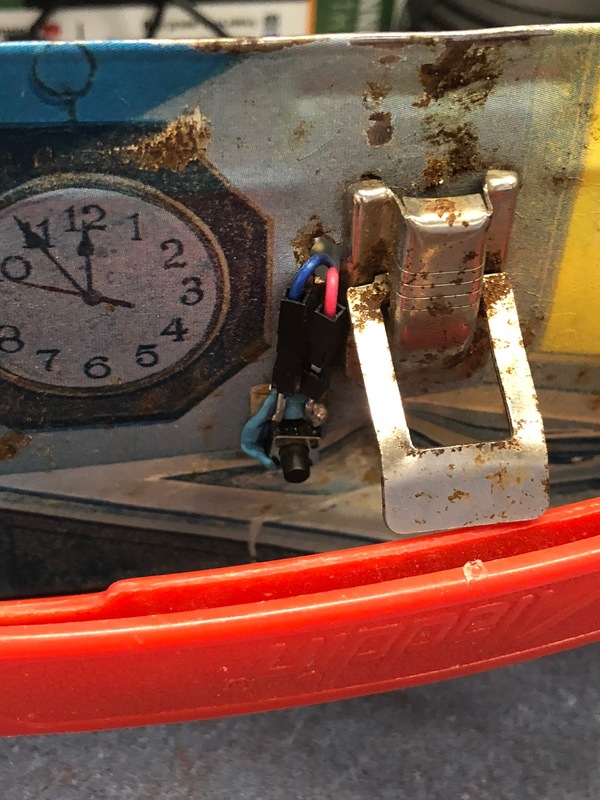 The rope is to keep the lid from falling backwards and the prop is something that can fold up and keep the lid from closing. It needs to be long and thing and have a hinge in the middle. I used Tinkercad to design one for the specific dimensions of my lunchbox. 7. The tweezers are for loading and unloading the micro sd card. If you do not plan to change out the card, you are fine and can skip the tweezers. I like to swap out the card with a Gaming card to play retro games. 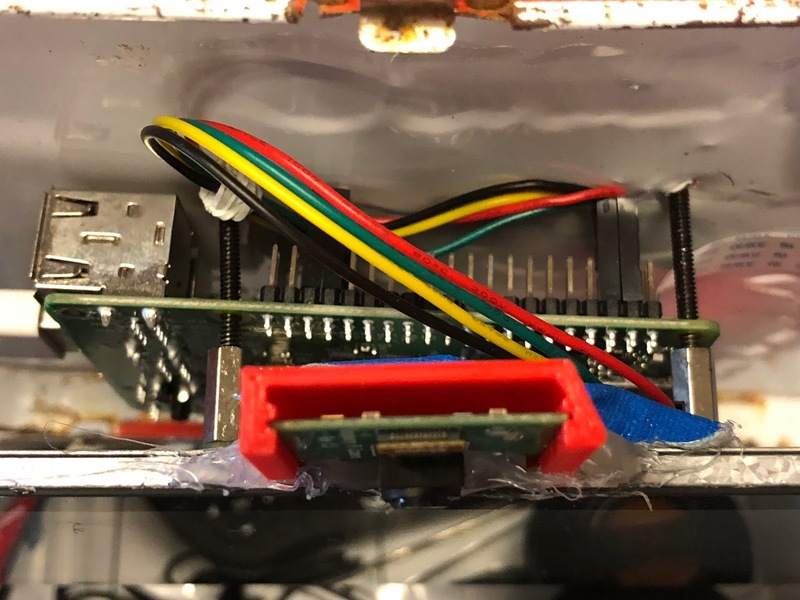 After that, you now have a Pi powered lunchbox computer. 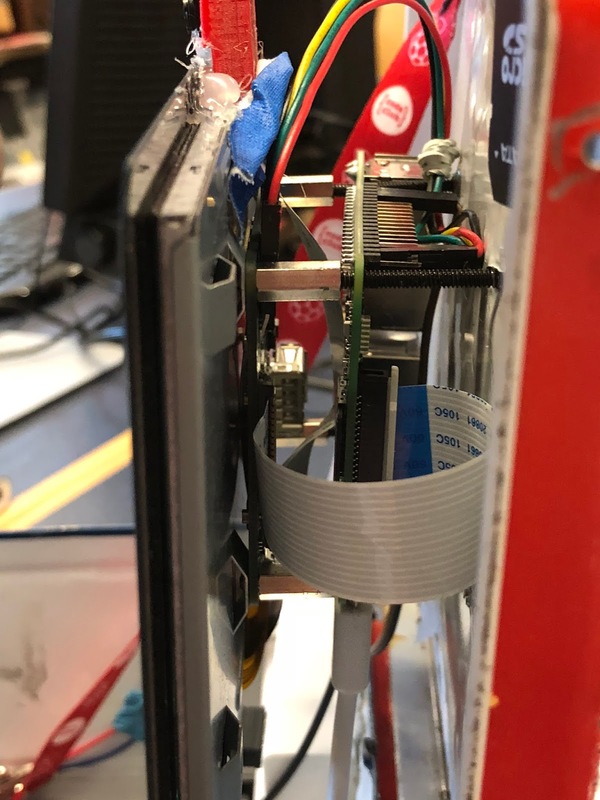 Before you attach the screen and Pi to the lunchbox, you can add a Raspberry Pi camera and mount it to the top of the screen. This will give you your own selfie station. The two wires that I added to the Pi are connected to small button. I ran some code that allows for the button to shutdown the entire system. I tucked it behind the handle of the Raspberry Pi preventing any accidental pushes while working. You need to solder the two wires to the button to the lunchbox, I used glue, and then run the wires along the bottom and then up to the top of the Pi and attach them to the GPIO and GRN pins on the Raspberry Pi. If you have any questions, please send me a tweet at @TheNerdyTeacher. If you create your own, please share them on Social and tag me so I can see your cool lunchbox too! Feeling pretty good today. Another moment to sit and think about stuff. I know, super specific right? I've been thinking about my Maker journey lately. I've been so busy with teaching, grading, and travel, I have not had time to dive into some Maker projects that have been sitting in my workspace for a few weeks. It can be a bit frustrating not working on things you are excited to Make, but that is part of the full-time teacher deal. I'm still getting tons of great feedback from people all over the world who have purchased my book. It is very humbling to hear from someone from the UK that has loved my book and it has inspired them to create a space for their students. However, I feel like a bit of a fraud when I have not had much time to support more own making our the Makerspace because of papers to grade, projects to assess, etc. I get stressed when I do not have the time I want to commit to helping every student that wants help. I'm not sure if this is a normal feeling for others, but I also do not know how many other educators are full time HS teachers trying to balance an awesome learning environment in the classroom for 150 students and an environment for Making in a high school of over 1600. I feel the obligation for the students that sit in my class, but I also built a Makerspace for students to connect and pursue things that matter to them. Have I failed because I can't do both at the level I feel is needed? Is this just a normal part of being a teacher that does as much as they can to support learning? It's frustrating. Life is about balance and I'm committed to finding the balance that will allow me to support the Making culture in the school and the learning environment in my classroom. It's a lofty goal, but I feel like it is a worthy one because of the positive impact it can have on students. Yesterday was the weekly meeting of the Programming Club I advise. It's a small collection of students who want to learn to code and create something fun. I tend to sit back and let the students organize their ideas and chime in when I think they need a suggestion here or there. This post is not going to be about forming a Programming Club or the different types of programming. This is about the value of this club, and any club, for all students. The students gathered in my room and could not stop joking around between ideas for the RPG game they want to create. Discussing current memes and inside jokes, this group was happy to have time in a space to just be themselves. The students were comfortable and all smiles. This is key for any club. I'm glad to give up my classroom for an hour or more after school every Thursday so these students can get together, nerd out on the current games they are playing, talk about the plot and design of the game they want to create, and just have a good time. As teachers, it is important that we create spaces for students in our classroom where students feel good about sharing their thoughts, even if it is a minority opinion. Choosing to advise clubs is another step teachers and school can take to support students and give them a place before or after school where they can explore topics that matter to them. These clubs could be chess, yoga, checkers, basketball, video games, comic books, or any other type of club that lets students come together and see there are other students that love the same thing they love. Making those connections can help some students get through some very tough times. While taking time out of a teacher's day can be tough, I'm happy to give these students an hour of my time after school so they can just be kids doing something they love. I want to create the best environment for all of my students during class and after school. Advising a club is one simple way to do that. It has been too long since I've posted on here. No excuses either. I just cut my reflection because I was busy. That's not to say that I have not had ideas and reflection in my head, I've just told myself I've been too busy and nobody would care anyway. The "nobody would care" part is such a silly excuse and a huge cop-out. Reflection should always be about inner growth. If that reflection leads to great understanding worth sharing, that is awesome, but that is not always the case. 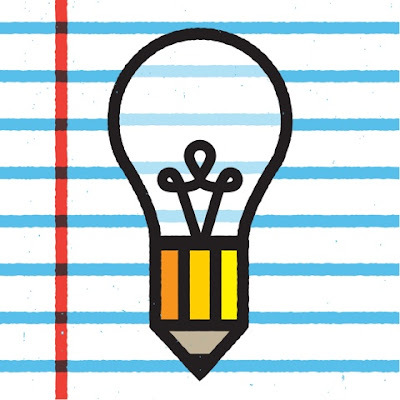 The core of my blogging has always been about getting ideas out of my head and onto digital paper. I need to refocus and reflect more on my site. I have my Anchor channel which is a nice and quick format to share ideas. There is always time if you make the time and I need to do that more. Look for more rambling reflections in the coming days and weeks and I try to refocus on my practice and reflect out loud. I'm excited to announce the launch of Education/Innovation on Anchor.FM. Anchor describes itself as, "It’s like radio, but bite-sized, interactive, addictive, and way more fun." It's an amazing format that takes the idea of podcasting and makes it accessible and interactive. Instead of having 30 minute episodes once a week, a person can jump on the app, shares some quick thoughts, and other users can call in and leave their thoughts. I've been looking to do podcasting again, but the work behind running a full podcast can be too much. Anchor allows me to share all of my nerdiness is simple and easy to consume chunks. It also allows my friends to share their ideas as well. Anchor is free to use and easy to sign up on your iOS or Android phone. You can favorite other great stations and check them out. I've found one called Star Wars Explained. This is a perfect platform for me to nerd out over Star Wars and then call in and leave my thoughts. Long term, I think this has tons of applications in the classroom and I look forward to exploring that down the line. For now, check out my station and call in if you have something to add. I look forward to your thoughts and hope you will create your own station for me to enjoy as well.